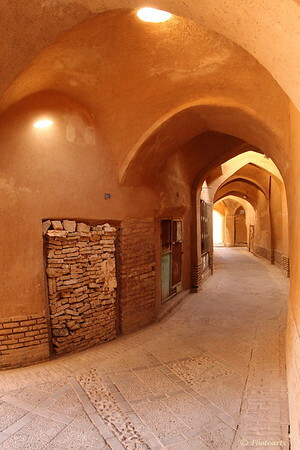 Centuries old mud homes in old town Yazd make you feel like you have stepped back in time as you walk the narrow streets with endless arches overhead. This part of central Iran is hot and gets very little rain but this architectural design has withstood the test of time. This has a great mood. Nice glimpse into this historic old town! One that I unfortunately missed on my trip to Iran. One long leading line or passage !! Lovely shot indeed ! This image of the passageway and arches really draws me into it, wanting to follow around and see what is there around the bend.